but as a distribution center with access to railway and steamship traffic on Okanagan Lake. 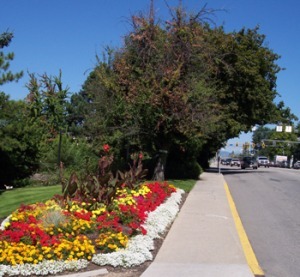 Vernon grew as more settlers arrived to build businesses and lives in the North Okanagan. 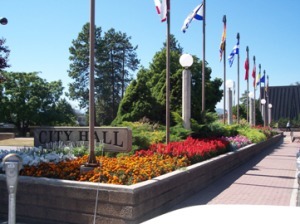 Flags of Canada and its provinces add to the many colors found on the grounds of Vernon City Hall. 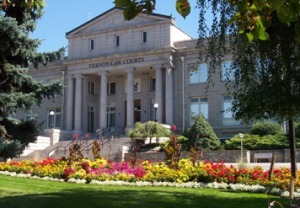 One of the first buildings constructed of local granite was the Vernon courthouse, built in 1911, which became the location for other government agencies of the time. 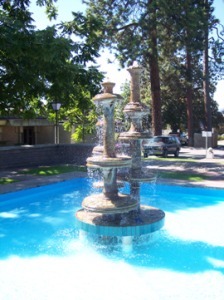 Vernon Courthouse overlooks another picturesque park, complete with manmade waterfall. 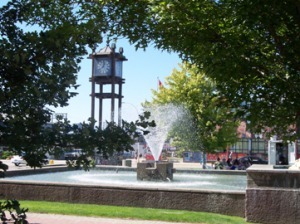 The Courthouse Park waterfall provides a favourite lunchtime location. A picnic on the grass in the cool shade of large trees makes for a welcome contrast to the concrete and pavement of urbanization a few steps away. 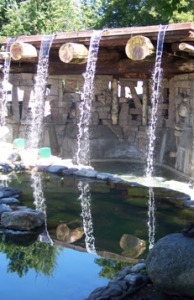 A cool refreshing place to be on a hot thirty-plus degree day. Borrow a good book from the nearby library and park yourself on a handy bench under the trees. 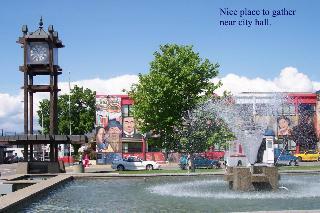 In addition to being a popular people place, you will find summer-evening open-air concerts here.